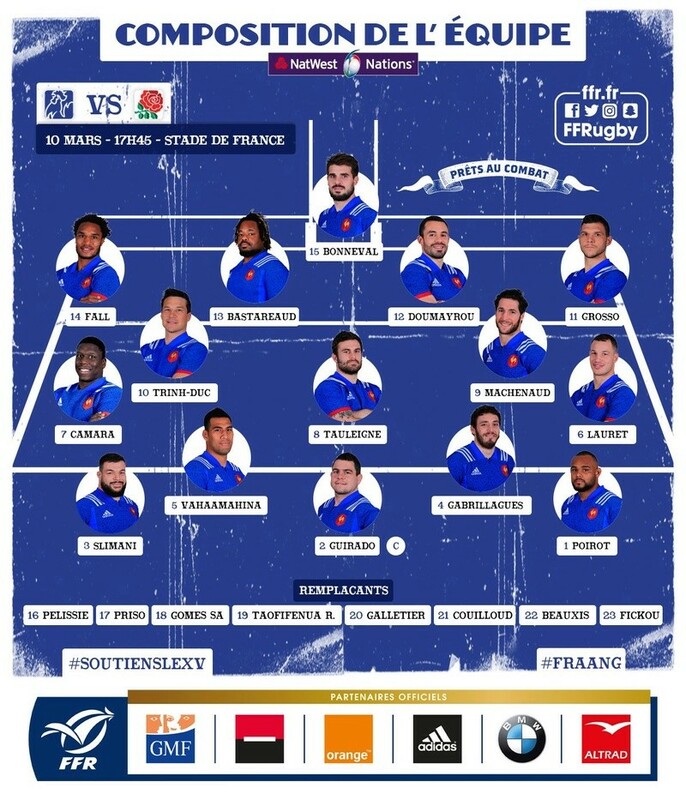 How our back line performs will be very interesting, firstly unfortunately due to our BR selection and secondly because dropping JJ was a very tough marginal call and tbh not one I agree with considering the rubbish ball he had to contend with against Scotland. There are plenty of others who are equally fatigued and performing poorly who have not been axed but who had greater influence in the games outcome. As to countering Bastereau(spellimg?) I don't see why we should be so defensively minded. I fully appreciate the difficulties our injuries and suspensions plus the general fatigue of the greater squad, however EJ has determined a very rigid strategic approach that stifles our inate creativity and weakens our overall effectiveness. Why would you select a pacy back 3 when the BR will not be there to support them. Why engage a kicking strategy that results in gifting precious possession to the opposition? EJ is edging himself towards the corner just when we need to be insightful and muscularly expansive. Do you not think Te'o has been picked to mark Bastereaud - a case of horses for courses rather than a case of JJ being seen as awful against Scotland? JJ is on the bench and will presumably come on after 50 minutes when Bastereaud runs out of puff and takes an early bath. Agree on the England back row though. It seems EJ has learnt nothing from the Scotland game. But again with 2 back rowers on the bench and no second row, there will be a planned change to the back row after 50 minutes or so to replace Hughes and Launchbury with Simmonds and Haskell (with Lawes reverting into the second row). For good or bad reasons, EJ seems to think we need to more than match the French team for physicality in the opening 40/50 minutes and then can revert to pace and a bit of flair when they run out of puff. Which is an unnecessarily gamble as far as I can see. We're allowing France at home in the biggest game of their tournament the opportunity to compete and gain confidence. Added to that if it is Peyper who is whistling the game then he is renowned as a home town ref and so why increase the opportunity for marginal calls to go against us. We better win or I'll tell you they'll be pitchforks down the cabbage patch! The thing to remember is that this England team seems to work very well on morale, and when things go well, it's unlikely that the French will be able to counter it. If (and it's a big if) England get a couple o scores in early, it could be that the French heads will start to drop, and players such as Joseph and Simmons could have a field day. I am not entirely certain that the "off" day against Scotland was a bad thing. We needed to know what it felt like to lose, and this can often be the biggest motivator for a team. Eddie will have made his feelings very clear and small tweaks to the way that the back row played could make big differences. I can imagine he's read the riot act to his players. In my mind it's going to go one of three ways: A narrow French victory plagued by English mistakes and silly penalties, a narrow England victory mostly due to penalty kicks, or a couple of early tries causes the French to implode and the English backs and forwards will score for fun. I honestly believe JJ's defense is more than adequate to handle Bastareau and furthermore JJ will exploit his weakness far better than Te'o, who is the epitome of an impact player and not a starter. I really do appreciate the 'loss' benefits argument, but it really is a card you don't want to play often and mores the point it should only occur in the biggest games, e.g title deciders etc. No disrespect intended but we've gone down in a very predicable fashion, which suggests there are greater issues a foot, which actually there are; Leadership, selection and strategy all within the realm of player welfare exhaustion. We should comfortably have enough to beat france. Doesn't mean it's beyond feasibility we get beat. Anyone calling for jones' head should we get beat, even in the next 2 games, needs to give themselves a talking to. It would be a nonsense to get rid of Jones. This isn't a Bomber type scenery, however everyone is open to criticism where appropriate. The main point has to be that lessons must be learnt, that is key for all concerned and Sunnyside up is the positive take away this tournament presents. In the bigger picture it is fascinating to try to comprehend the timescales involved in the development and production of a competitive international side. We've obviously got one more 6 nations, summer tour and autumn series to play with, however if we continue in this injury crisis position and fail to gain some progressive consistency, well if you're being objective you would have to say time and games are in short supply. Its going to be very exciting. There's an argument about leadership which is why we've seen hartley entrenched in the team. Along with positive impact from the bench. I do like the predictable nature of England though. I like Hartley, I just don't see him making it to Japan in a credible sense. If he does stay on board then I feel we will have failed to develop the maturity necessary to succeed. Basically the greater squad needs to mature and take ownership of the game. I don't see Farrell as the long term answer. Simply I don't believe he has the captaincy skill set, or quite frankly the intelligence required. Either Launchbury or Itoje are very able candidates who are excellently placed to progress the groups development. I obviously rate both the locks. Could see Itoje going onto be a very good captain. Not sure what you've seen in Launchbury which you haven't in Farrell? Really? Launchbury is head and shoulders ahead of Farrell. Incidentally he's an excellent club captain at WASPS. All good experience. He's a bright lad too. kingelderfield wrote: Really? Launchbury is head and shoulders ahead of Farrell. Incidentally he's an excellent club captain at WASPS. So what have you seen in Launchbury which you haven't seen in Farrell. All you've said is one plays for wasps. I think I'd rather Launchbury carries on doing his thing while looking like he's dying. He is an incredible player really. 5 penalties and a conversion by Hardwick, plus a try by Cameron Redpath. It will be interesting to see if Redpath goes on to get a chance in the full England team - EJ certainly doesn't seem to rate any of the older scrum halfs England half with Wigglesworth's recall. A bit of payback for the Murrayfield defeat. Regarding England's team tomorrow, is Lawes really one of the best 3 back row players available to England? Even with injuries it is a pretty sad indictment of the back row talent in England, particularly when you look at how Scotland blew us away there. Lawes's main contribution seems to be in the lineout a function he could still do if picked in the second row. I haven't seen any turnovers and not too many great tackles. I would take Ewers or Armand above Lawes all day. EJ may be right that he’s picked the best BR available. If so this is some indictment of the quality of the English BR. Injuries hit every side and England claims to pride itself on strength in depth. In the BR there’s some depth, but little strength beyond 1st choice. I just can’t forget the slagging Stewie got for Lawes at 6. And the English BR was an area EJ originally highlighted as requiring some work. If Robshaw gets injured we are truly stuffed. Barney McGrew did it wrote: EJ may be right that he’s picked the best BR available. If so this is some indictment of the quality of the English BR. Injuries hit every side and England claims to pride itself on strength in depth. In the BR there’s some depth, but little strength beyond 1st choice. I just can’t forget the slagging Stewie got for Lawes at 6. And the English BR was an area EJ originally highlighted as requiring some work. If Robshaw gets injured we are truly stuffed. Considering the amount of money, amount of clubs, quantity of players available, massive funding for youth rugby, internationally renown top rugby schools, and the very high quality of the back row players at under 20 international level how on earth can England have a lack of backrow players to choose from? We don't have an issue really, as mentioned above even with our injuries, there are still plenty better than Lawes and that's no disrespect to him. No, first and for most this is a selection decision, one that confounds all the modern indicator's. EJ is wasting precious development games/time. England need to win the game today with a (bonus point win ) against France. Listening to Matt Dawson's podcast the other day, England have never scored 4 teries against France in France. So it will be interesting to see if they ( England )can score 4 tries today for the first time today and secure a bonus point win, that will keep England on track for a show down with Ireland on next week for the title.....That is of course providing Ireland beat Scotland today. Deep breath, we have to be favourites to beat France 'today'. The problem, especially for us fans, is the levers of doubt, the uncertainties that could go against us, as well as the choices made as to how we set our pieces upon the board. Makes it all very exciting, let's just hope it lives up to its billing. I am sure it will. Enjoy the game! All are hoping for a team reaction after the last performance. I note this game has SH ref which when England are away is generally not a good portent. So long as England raise their intensity and don't give any opportunity for the ref to have an influence, a positive result is achievable. Petulant Farrell vs one of Johnson's Aire's? Farrell is one heck of a player though I can't see too many captaincy characteristic's. Launchbury could be very good, however as I've said before Itoje is the one who really ticks all the boxes. He certainly has the experience. Watching the Ireland Scotland game...the big thing I want to see today is that insane intensity and brutal physicality in the rucks and mauls. We'll need that to beat Ireland, and we have to start that v France. 4 tries needed now! Oh and the win. Ah Irelands Championship....I just cant bear the thought of them getting the Slam at Twickenham on Paddys day... !!! Who on earth is this interviewing Eddie Jones on the BBC. POC singing the praises of Farrells leadership based on the lions tour. No 7&1/2 wrote: POC singing the praises of Farrells leadership based on the lions tour. Exactly. Who is he anyway? I think this is a great game for Farrell to captain. I really do think he is one of the best players going around and is a very good leader. Just wish he would return to 10 where I think he is far more effective. Huge gap in the defence there though! Took the referee long enough to whistle for that obvious forward pass. Why are we so slow, undynamic and unaggressive at the rucks and breakdowns...? GeordieFalcon wrote: Why are we so slow, undynamic and unaggressive at the rucks and breakdowns...? So very slow again and conceding a penalty. Very un-England like. Quickly seeing the positives and minuses of the back row. Losing the breakdown killing their lineout. Well this game is a scrappy mess. Big clash after the kick there, the French baying for May's blood. Nothing in it for me. Englands tactics at the breakdown need an overhaul...its a serious problem...and if it stays as it is...they can forget about any World Cup challenge next year! Blooming heck. Vunipola winning scrum penalties. For me wrongly but pat on the back for him and Hatley!